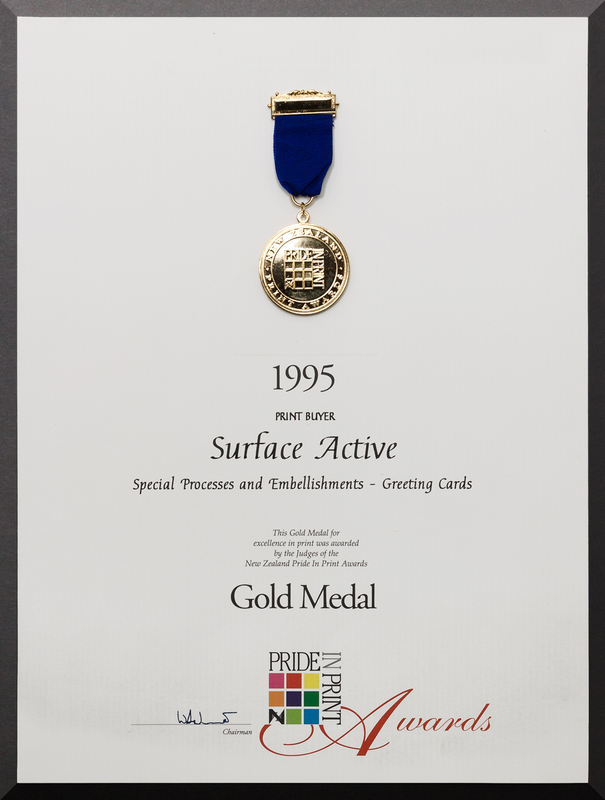 The set of brand new Craig Fletcher Art fully sculptured embossed and match printed greeting cards were awarded the best of the best ‘print special processes and embellishments’ in the 1995 New Zealand Pride In Print Awards. Established in 1993 with the goal to promote excellence in print in New Zealand, the Pride In Print Awards are the pinnacle of recognition and the showpiece for the best standards in print communication products of any given year. The criteria for entry is that all print work must be done in New Zealand. A Gold Pride in Print award is recognition from the industry to highlight phenomenal work being produced by New Zealand graphic designers and printers. Expert panels of judges evaluate and rank work according to a standard based on technical excellence in all facets of the production process, elements of typography and good design are part of this judgement, as is the effective and innovative use of materials. 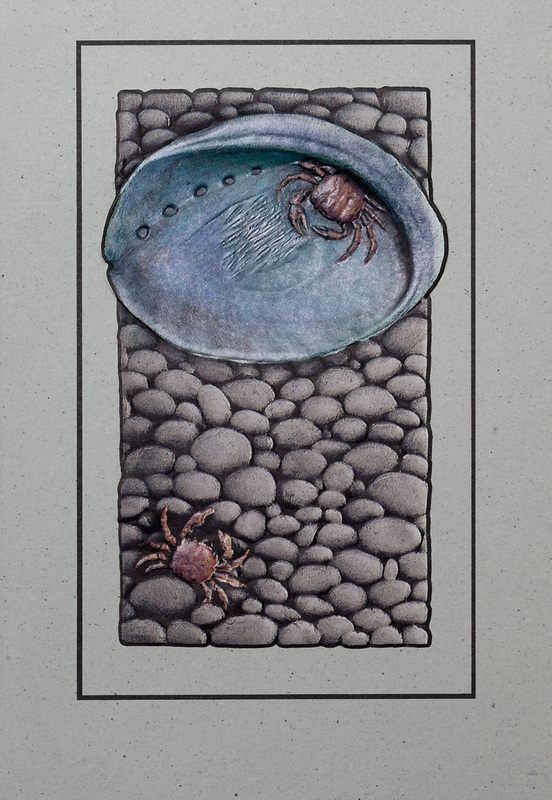 Craig Fletcher is a ceramic artist whose technique is to hand paint water colour washes over low-relief ceramic sculptures. Simply framed they are a painted sculpture, a sculptural painting. Craig and I became acquainted at the Christchurch Arts Centre Market in 1991, we sold his jewellery from our Surface Active T-shirt stall on the weekends for years. I became aware of the services offered by US firm Universal Engraving from an advert in Print magazine in the late 80s, I faxed them and received back their capabilities brochure in the mail. Along with Craig 1993–2001 Chrissie and I exhibited our T-shirts at the Great New Zealand Craft Shows nationwide during the winter months. Craig’s idea for the range of greeting cards developed out of conversations between Craig and I in 1994. For pre-press technical support I worked closely with photo litho service bureau Colortronic who produced our T-shirt mail order catalogue each year. Colortronic had just added a high resolution digital photography studio to their services. My supervision of coordination between the photography of Craig’s original artwork, the photo-litho pre-press process in Christchurch and Universal Engraving in Kansas was essential for ensuring the handover of the plates and fully sculpted embossing forms to the printer, Rangiora Printers, was all on track for them to print and finish the job in a smooth workflow to achieve delivery deadlines, and quality work to budget. Besides producing the finished artwork, coordinating and supervising pre-press and print production, my role was collaborating with Craig on the design and art direction of the cards at concept development stage, producing mock-ups of his draft concepts for review. Unpainted copies of Craig’s original ceramic embossed artworks were couriered to Universal Engraving in Kansas. Their die-makers further flattened Craig’s original low relief works to conform to the known limits of the card stock’s ability to be formed. The final dies supplied are in the form of a male & female pair. They are not simply negative and positive relief copies of one another, a precise allowance is made for the thickness of the card between the two. This ensures that maximum sculptural forming of the card can be achieved with minimal risk of breaking or tearing the card. For the die makers to achieve perfect registration of the embossing to match the full colour printing the magenta channel film separation for each greeting card was included with Craig’s original ceramic art sent to Kansas City. Design & art direction: Craig Fletcher, Shaun Waugh collab.